Move your audience to action. Increase engagement, retention, motivation, and conversion using rich media made simply with Vyond. Vyond is changing the way the world communicates, one video at a time. Vyond lets you create videos easily with our library of templates, sounds, props, and so much more. Great for training your distributed workforce or achieving higher conversion rates for your marketing team — while being flexible and affordable enough for any organization. Vyond is the essential tool for creating content that drives positive business outcomes. Start transforming generic content into dynamic results in minutes. Engage your learners in a truly captivating way. Use active storytelling, repurpose and customize content, and improve learning outcomes with better, more visual communication. Vyond’s flexible platform helps you easily incorporate video into your campaigns to improve marketing results. Create content that motivates your audience to take action. Improve company-wide collaboration, communication, and culture through video. Get started in minutes and cut through the clutter to get your message across. From sales enablement to compliance, make videos that fit the needs of your business and help you reach your objectives. With a full library of customizable templates, it only takes a few minutes to begin creating. Create media that doesn’t hurt your bottom line. Your team gets up to speed fast with prebuilt templates, a library of resources, and a full suite of collaboration tools. Transform the way your organization communicates through video that’s customizable to your brand and department needs. 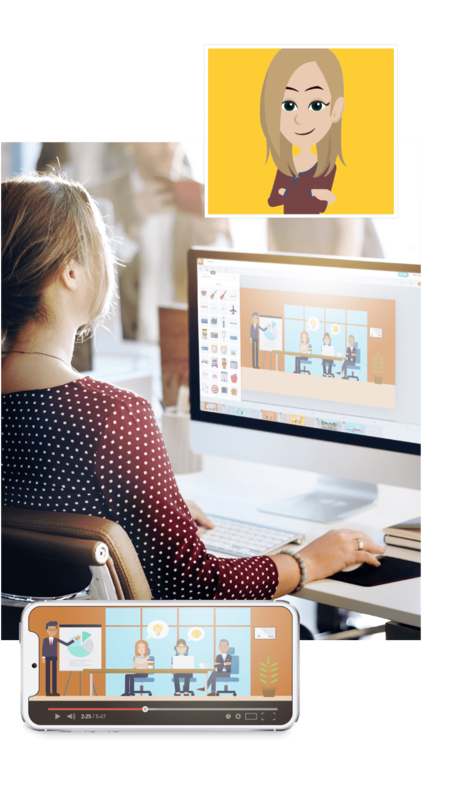 From small-business owners to consultants to university educators, the platform and plan flexibility of Vyond allows you to engage and captivate with video. Don’t pay thousands for one video when you can affordably make unlimited videos with Vyond. Elevate your communication in a way that’s accessible, easy, and affordable. Our team has IT at its heart, and we strive to protect your data with the highest standards. Our security measures and development process mean you can trust us to keep your data safe and secure. The best form of communication is telling a compelling story. And with Vyond, you can tell these stories beautifully and visually through video. Instead of stale, static text, you can now communicate like a pro, without the pro budget. Get started today and unleash your inner maker. Here’s what our makers say.